The last motoring entry was an October report of oil pressure loss and a knock from the motor. 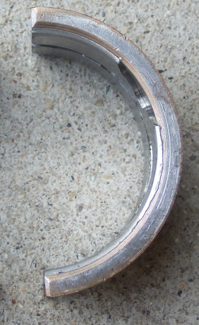 Since then, the motor has been taken apart, and its clear: the rod bearings had begun to fail and fall apart. There was separation (delamination) of the babbit from the mounting shell. 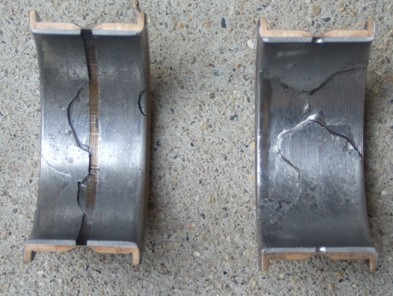 of tin, lead, copper, and antimony, used to reduce friction in bearings, developed by US inventor Isaac Babbit in 1839. By itself, it works well, but the main issue is the connection to the shells. To get good adhesion, the bronze shell is lined with tin, and then the babbit poured directly on the tin and either machined or hand scraped. The layer of tin adds yet another thermal barrier and this can add to the possibility of separation. To address this, vintage race cars had the babbit poured directly in the cap or conrod: one less connection to go bad. The reason for the shell is serviceability: shells could be replaced readily, whereas a direct pour into the rod or block would require careful line boring or machining. Thin shell bearings are the next generation. The babbit had been poured into the shells some many years ago, and we never knew its source. It looked very fresh upon inspection. It dated from the 1960’s and had been matched to a reground crankshaft. There are two ways to test the bond of the babbit to the shell: the old school way is by the “ding” test – where the shell is hung up and tapped: if good, one hears a clear sound, and if not, a dull sound. There is said to be some ultrasound testing now available, unknown then. Another issue is the thickness of the babbit. General understanding is that it should be about .5 mm thick – and the babbit in this motor was about 1 mm thick. There is a loss of strength in the white metal when it is thicker, but it is not clear if this was excessive. The babbit was separating from the shells, not just on the one conrod, but on all. These pieces floating around the engine did no good, so there is some serious work ahead.